That’s what we celebrate in April with chocolate eggs, egg hunts, bubbles, skipping ropes and pastel colors and mud pies and splashy puddles. I’ve partnered with Kinder as a #KinderMom to celebrate this fun time once again. 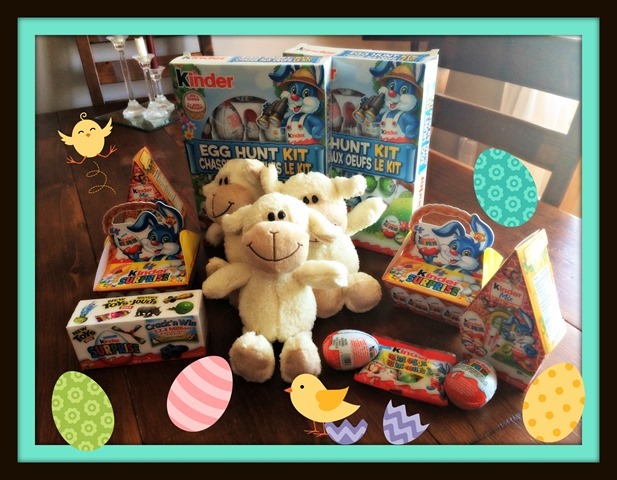 Did you catch the Kinder Hunt Eggstraveganza I posted about last week? I hope so! Our Easter weekend starts in church on Friday celebrating Christ’s death and ends in church on Sunday as we sing ‘up from the grave He arose” triumphantly, celebrating His victory. That my friends is Easter. This year a friend gave us a book called The Sparrow’s Easter Song and we read it today, what a sweet book. The illustrations are well done and the book reads in a lyrical, rhyming verse. But Saturday? Saturday we celebrate Happy Spring! Happy Spring is about chocolate and almost always includes Kinder. My children each have a basket and follow the little trail from their rooms into the main room where our official hunt begins. My children are starting to get a little older so next year we might be doing a little modification…maybe using the color-coded method that some families use and maybe moving our hunt outdoors to add a little extra challenge. Can I also add that mama enjoys the Kinder Mini Eggs immensely – oh, that delightful hazelnut filling! Might I suggest allowing yourself to indulge a little along with the children? Kinder is about chocolate…and also about giving back. I love that they do this each spring, in great part because of our own miracle story. I love Kinder chocolate and I love that they support the hospital that made all the difference to our family! Do you have a favorite Kinder product? Or do you have an egg hunting tip to share? I’d love to hear! This post is under “Reviews/Giveaways” and has no comments so far.